Last month, STAND activists celebrated the 70th anniversary of the Genocide Convention, the landmark treaty that defined genocide as an international crime and committed signatories to working to prevent genocide and punish its perpetrators. In celebrating, we recognized the urgent need to recommit ourselves to its aims. 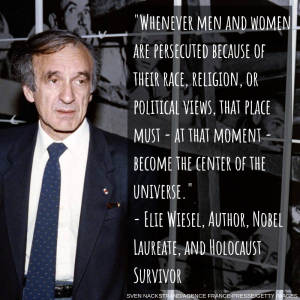 Yesterday, after four years of dogged advocacy, the Elie Wiesel Genocide and Atrocities Prevention Act was signed into law by President Trump. The signing of this legislation represents the most tangible progress the United States has made towards genocide and atrocities prevention since President Reagan signed the Genocide Convention in 1988. Named after Nobel laureate and Holocaust survivor Elie Wiesel, the Elie Wiesel Genocide and Atrocity Prevention Act will bolster the ability of the US to contribute to ending and preventing genocide and mass atrocities wherever they occur. First introduced in 2016, the bill requires training for Foreign Service Officers placed in areas at risk of atrocities in order to better recognize and respond to early warning signs. It also supports interagency coordination through structures such as the Atrocities Prevention Board, to facilitate a whole-of-government approach to prevent and respond to emerging atrocities in at-risk countries. Finally, the Act requires regular reporting to Congress regarding these efforts. Since 2009, when STAND students advocated for the passage of S.Con.Res 71, a resolution affirming U.S. national interest in preventing genocide, we have recognized the need to improve U.S. foreign policy approaches to emerging atrocity issues. Today, as an organization committed to building a world in which the global community is invested in preventing, mitigating, and sustainably resolving genocide and mass atrocities, we affirm this crucial, bipartisan effort towards achieving this vision. This victory would not have been possible without the long-term commitment of our activists and our partner organizations, including the Friends Committee on National Legislation, the Alliance for Peacebuilding, the 21st Century Wilberforce Initiative, Jewish World Watch, In Defense of Christians, Peace Direct, and many others. Read the full text of the legislation here. Casey Bush is the co-Student Director of STAND. Casey recently graduated with her BA in History and Holocaust and Genocide Studies from Clark University in Worcester, Massachusetts and is preparing to pursue a masters at the same institution. She is available for comment at cbush@standnow.org. This entry was posted in Burma, Burundi, Central African Republic, Conflicts, Congo, Emerging Conflicts, South Sudan, Successes, Sudan, Syria, Yemen and tagged atrocities prevention, easyasapb, Elie Wiesel, GAPA, genocide, genocide prevention, genprev, pledgegapagapa, wiesel act. Bookmark the permalink.